Freshly Made Sketches: Winners For Sketch 253! A very big thank you to everyone who participated in this week's challenge! I'm always excited to see lots of cards in the gallery. 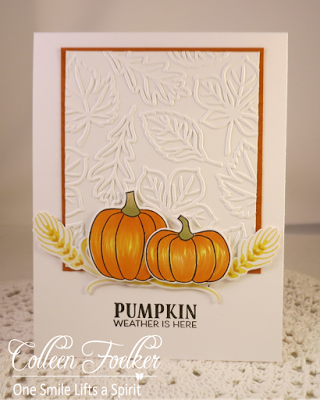 This week's Queen of Clean is Colleen and her fabulous fall card. Those pumpkins are so beautifully coloured and I love the embossed leaf background. Topped off with a super cute sentiment! Congrats, Colleen, you are Queen of Clean! Congrats to all of the winners and thanks for the shout out!! This made my day. So happy for the shout out, Kim! I'm thrilled to be among so many awesome cards! Congratulations to Colleen, on her wonderful pumpkin card, and to all those in the gallery! Thrilled to see mine there, too! Thank you, Narelle...I'm happy that my cake-toting bear made you smile! Beautiful card Colleen - congrats on your win! Thanks for including mine in the HM's Karren...always makes my days!